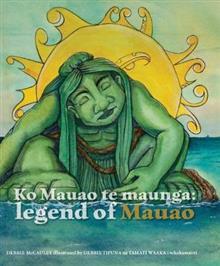 This bilingual children's picture book in English and Te Reo Maori retells the traditional Legend of Mauao and includes a glossary and pronunciation guide, Mauao facts, a Mauao timeline, important places on Mauao, oral traditions and activities for children. There is also a big b... read full description below. The history of Mauao, along with the legend, is one of heartbreak and struggle, but also one of endurance, strength and unity. Mauao stands guard at the entrance to Te Awanui, the Tauranga Harbour. At over two million years old, he is a tipuna and sacred taonga, manifesting both the past and the present, as well as giving us hope for the future. Debbie McCauley is a librarian, historian, author, and owner of Mauao Publishing, a Tauranga based indie business passionate about connecting Aotearoa's tamariki with beautifully produced books telling stories from our own backyard.